I've had the pleasure to work with Amber Chandler for almost a year now and she never ceases to amaze me. In addition to being an successful Nationally Board Certified middle school teacher ELA teacher, Amber blogs, writes books, and leads loads of other education-related projects. Her impressive energy level and passion never seems to wane and one day I had a Carrie Bradshaw "I couldn't help be wonder?" moment as she told me that her second book would be coming out this summer. So I asked her point blank, "why do you write?" And below is the incredible response from that simple question. I hope you enjoy reading it and are inspired as much as I was. What would a good “why I write” piece be without a Hemingway quote? I’ll put it right up front to get it out of the way: “There is nothing to writing. 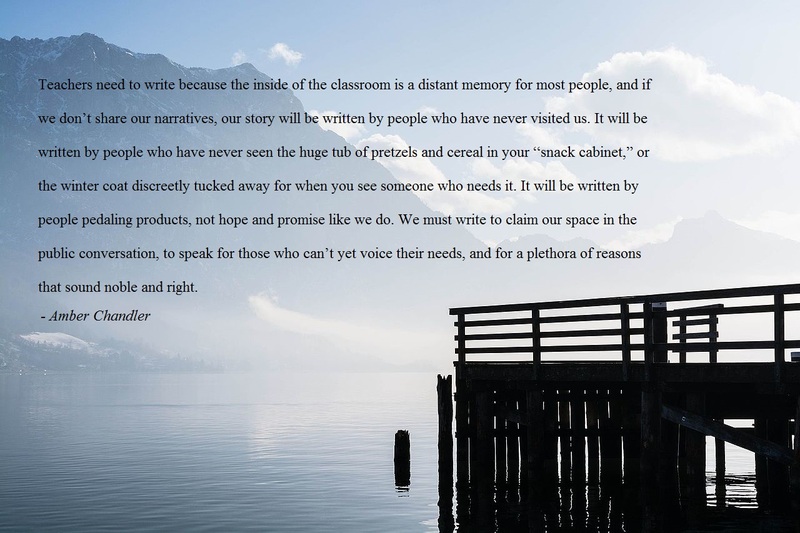 All you do is sit down at a typewriter and bleed.” Now, I’ll get to what needs to be said, bleeding heart and all: Teachers need to write because the inside of the classroom is a distant memory for most people, and if we don’t share our narratives, our story will be written by people who have never visited us. It will be written by people who have never seen the huge tub of pretzels and cereal in your “snack cabinet,” or the winter coat discreetly tucked away for when you see someone who needs it. It will be written by people pedaling products, not hope and promise like we do. We must write to claim our space in the public conversation, to speak for those who can’t yet voice their needs, and for a plethora of reasons that sound noble and right. But that’s not why I write. I never set out to catch the world on fire; instead, I write to light my own way. It is in my writing that I find reflection, and can talk my way through the impossible dim way forward. I’ve been a writer all my life—a secret scribbler, journal keeper, dream web maker, and have been jotting down ideas since I remember. When I had my first child, 12 years ago, my writing seemed so inconsequential that I gave it up completely. That sounds dramatic, but it really was that way. The minute I had created a living and breathing thing, all other “things” were secondary at best. The trivial things I’ve loved to write about were suddenly too trivial, or simply gone, and I soon began to write snippets about parenting, but that too seemed so embarrassing. I certainly couldn’t give advice, as I did not know what I was doing, and thankfully I knew that, but I also refused to share the rawness of new motherhood. The itch never went away, but I just didn’t know who I was enough to know what to say. Then, just as “it” had left, the spark returned, and the words came to me like gifts from the past, and I’m forever grateful for the opportunity that arrived at about 4 o’clock in the morning. Share My Lesson used to have these “Marathon Weekends” where teachers would seclude themselves from all the distractions of our real lives, and we’d come together to vet materials, upload resources and essentially give our seal of approval. My second child was 3 or 4, and I relished these weekends as “me time,” even though I was never alone. Sitting around the table with educators from all over the country—in a conference room fueled by jelly beans, coffee and dance party stretch breaks—an idea came to me: “How many years of experience do we have, those of us, at this one table?” That spark, that question, sent me scribbling again after nearly a decade, this time adding up our collective experience, and sharing a perspective that might be overlooked: We need each other, all of us, newbies and veterans, to sit down around tables and share what we know. This idea seemed pretty radical to me at the time, as my own career had been fairly solitary save for a few awesome mentors. I project confidence, even when I am scared to death, so I know I come across like a loner (or worse) sometimes. Writing gave me a chance to open my classroom, to share myself with other teachers, and learn from them as well. Writing was my way out of seclusion, my way to handle the ups and downs of being a teacher, and I found myself truly compelled to tell a different story about teaching than the one most people knew. I wanted to give voice to the experiences, to the heartache, to the pride so deep that it makes you shine. My writing life was reignited five or six years ago, with that one spark. My writing has now become a part of a career. My book The Flexible ELA Classroom: Tools for Differentiation 4-8 came out last fall, and I’m very proud of it. As I wrote that book, it came down to the fact that what differentiation really means is to be flexible, to do whatever it takes. This is not just a book for ELA or differentiation, but the beginning of a new way of seeing. Or, at least that is my plan! I keep coming back to the need for the individual to be at the center of all I do, which compelled me to explore the implications that social and emotional learning would have for my classroom. You can check out the second book in the Eye On Education Flexible Classroom series, SEL in the Flexible Classroom: Social Emotional Learning for Student Success, this fall. If I used a Hemingway quote to write myself into this piece, how about using a Toni Morrison one to get me out of it? “If there is a book you want to read, but it hasn’t been written yet, then you must write it.” The book I wanted to read would tell the story of a teacher who knew exactly what she was doing one minute, and rethinking it the next. It would tell the story of how one person can make a difference. It would be about parents, philosophy, and probably ruffle some feathers. It would be inspiring, and a little edgy. It would make teaching look easy, but impress upon its readers that it is truly hard to teach. It would, above all, be real. Really my classroom, really me, really what I do when I teach. This is what being a writer has come to mean to me—sharing the light that I gather from my students, illuminating the dim path ahead for myself and anyone who wants to walk beside me. Love her vibe? Make sure to check out her other blogs on SML (you can see the most recent listed on the right side of the page and I highly you suggest you also check out her website. And she has uploaded more than 40 of her own lessons that she uses with her own kids so make sure to check them out too.